This will make about twelve 3 inch biscuits. You can roll them out thicker if you like but you will end up with less. The sour cream in this recipe makes the dough really soft. 1Preheat oven to 400. You can use non stick spray if you like but a very light dusting of flour or corn meal will do the trick. 2Mix together Flour, baking powder, baking soda, salt in a large bowl that you can get your hands in. 3Grate your butter into the flour and work in with your hands! It's fun they said! This will seem messy but its kinda therapeutic. You can use a food processor too if you are in a hurry. Combine until it looks like coarse cornmeal. 4Make a small well in the center of the flour mixture. Grab your egg and get cracking! Make sure to omit the shells! Add in sour cream and sugar. Blend with a fork then gradually combine with the flour. Keep combining until dough is forms into a ball and is releasing from the side of the bowl. 5On a floured work surface, roll out dough to about 1/2 thick and cut into 3 inch circles. 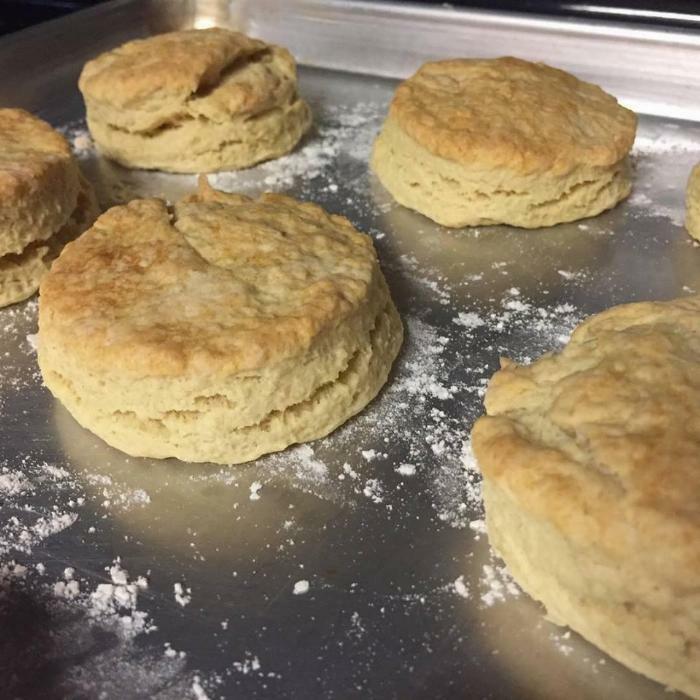 6Place on Sheet pan and bake about 8 minutes until the biscuits have just risen. then turn on your broiler to brown the tops. Be careful at this point because they brown within a couple minutes. Don't walk away! Please leave us a comment if you enjoyed this recipe!